Tee's Blurbs: so WICKEDLY Wicked! 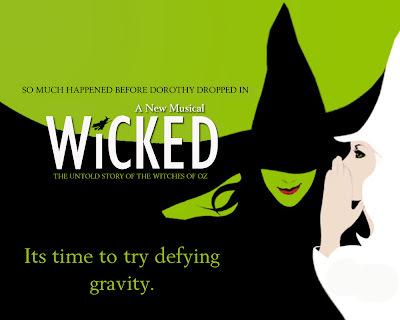 I thought I should post something about WICKED the musical here. it's been more than three months since we watched the show, but hey better late than never! "So much happened before Dorothy dropped in". That was the catch-phrase of Wicked. Growing up with "The Wizard of Oz" in betamax and captivated by Dorothy's red shoes more than anything else on the movie, I never really cared much about the Wicked Witch of the West and the wizard himself. Wicked gives a twist to the story - Oz after all, is full of secrets. It answers questions on how the elements in The Wizard of Oz came to be. Like: what's so special about those red shoes? How did the scarecrow and tinman came to be? How about those flying monkeys? I sure had fun piecing out the pieces myself. I was so drawn with the musical, everything was perfect. the lighting, scene, props, music, play of colors - superb! And though I did not get to read the book, I totally can relate! I laughed at the witty and funny puns - it was hilarious! I got moved by the touching scenes. and yeah, I must've clapped at every end of the scene too. and for a few moments, I can't help but stare, oh, Elpheba is so green! :)) Unlike it's predecessor, the Lion King - some scenes may not be kid-friendly, though. Oz, after all is full of secrets. And once the final secret was revealed and the curtain was about to fall for the final time, I was hoping the story goes on. For the entire show, I sure was bewitched. So... I wonder what's the next musical heading our way? Can't wait!